Are you demonstrating how unique you and your brand are? Do you show your potential clients and customers the areas of your offering that distinguish you from the rest? Having created a so many videos for businesses, I know for sure, there are parts of your business, product or offering that differentiates you from the rest of the crowd, things that you do that will make you stand out. Often it’s just having another pair of eyes, seeing you from a different perspective, that enables us to find the nugget of uniqueness, making you appear distinctly different. Once you have found the element of your business that distinguishes you and demonstrates your uniqueness, the best way of showcasing those differences is with your own video. And it’s been when I’ve been working with companies and individuals to create video for their business, we often identify those unique nuggets enabling us to make that business stand out. I was asked by a school in Norfolk to make a video. The Purpose of this video was to increase recruitment of students. Recruitment is now incredibly important to the life cycle of schools. At first the plan was to show what life was like for a new student joining the school in year 7. This series of films made for the school had an incredibly positive ROI, making a strong business case for their investment. When we were planning the video… we started to see some fairly unique benefits to clients using coastal vets… one of which was their home visit service, which was the part of the practice they were famous for… of course that featured in the video. The next example of uniqueness I wanted to share with you.. is from a shoot we did with an ice-cream parlour franchise business. 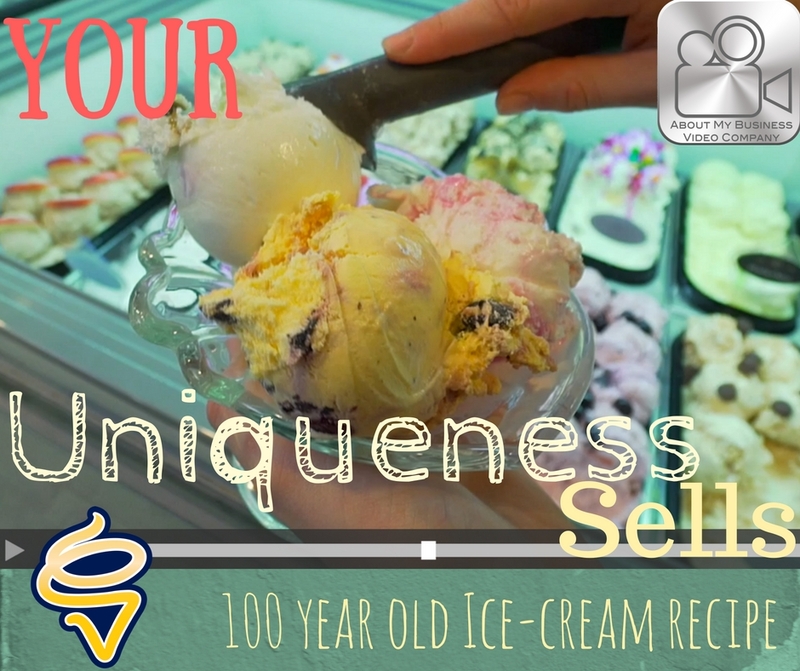 Each of the ice-cream parlours has a party room… made to look like a Willy Wonker type ice-cream factory… They use this facility to hold parties for birthdays and celebrations… which means that a the business is not as seasonal as you might expect. So this amazing business has 2 incredibly unique aspects that needed showcasing and there was no better way of getting that message out… than through video. … if you would like someone with experience in identifying unique aspects of businesses and helping them communicate that special nugget… then you should give me a call also… I’d be only too happy to help you expose that differentiating unique nugget that sells your business.